Oh, CeraVe. You make my heart sing. Or should I say my skin? Ever since I started using the Hydrating Cleanser, my face has looked and felt its absolute best. (See here for proof.) So I'm absolutely thrilled to offer one person the chance to win not only the Hydrating Cleanser, but the SA Renewing Lotion today. Here's what this duo can do for your skin. Hydrating Cleanser: A non-greasy cleanser formulated with MVE delivery technology, a controlled release of essential ceramides and other skin-nurturing ingredients over time. SA Renewing Lotion: The line's new moisturizer that repairs and restores bumpy skin with salicylic acid and its patented Multivesicular Emulsion for controlled release over time. This giveaway has a retail value of $25. Here's how to enter. 2) Like The Beauty of Life on Facebook and leave a comment on the Facebook post about this giveaway telling me why you want to win this skincare duo. This giveaway ends on Saturday, August 25 at midnight. One winner will be chosen AT RANDOM on Sunday, August 26. Maximum of THREE ENTRIES (one for each way listed above). Multiple entries will be disqualified. Giveaway is open to US residents only. I'm already following CeraVe on both Twitter and FB - I love their products!! thank you for your month of giveaways! This is one that would really serve me well. Heard amazing things about these products. My dr. even just recommended them! Would love to try. Best way to try the product is to win this....lol...Used so many skincare already from different expensive lines but nothing works that good. thank you CeraVe is amazing. So timely - my dermatologist JUST gave me samples of CeraVe face wash and moisturizer and I LOVE them! I'd really love to win this. Doctor recommended is a huge plus! I'm always looking for great products for my skin--thanks for so many wonderful giveaways this month! This sounds really nice! Thanks for the chance! 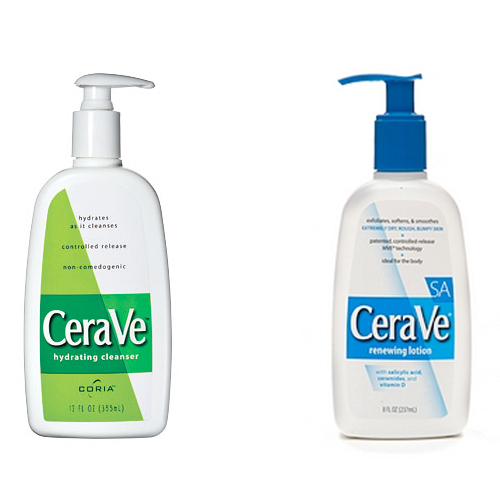 I've always wanted to try CeraVe, but been afraid to abandon my current skin care products. I would love to win! Oh man, I've been wanting this after seeing you post about your experience. Oh I would love this, I have an amazing dermatologist and she recommends this brand. I've used the lotion and love it! Great giveaway! I would love to try the hydrating cleanser! Thanks for the giveaway! I would love to try these products, thanks for the chance! Thank you for your giveaway! I would love to win this! I trying cerave lotion now to see how I react since I have sensitive skin. So far so good. Would love to win the set. Thank-you for the great giveaway. I would love to try these products. Thank you for the opportunity to win! I would love to win. Cerave product are great for my sensitive skin. This would be nice for my husband who works outside and goes through lotion like crazy. I've always wanted to try this line! My daughters dermatologist recommended CeraVe to us to help with her eczema. This is great stuff. Thank you for the chance to win, I have been longing to try CeraVe. Love this stuff! I used the hydrating cleaner.